Stainless steel pressure sensors with measuring ranges up to 1,000 bar (14,500 psi) are available for the model CPH62I0 hand-held pressure indicator. It is therefore particularly suitable as a test instrument for applications such as process engineering, chemical industry, refineries, etc. 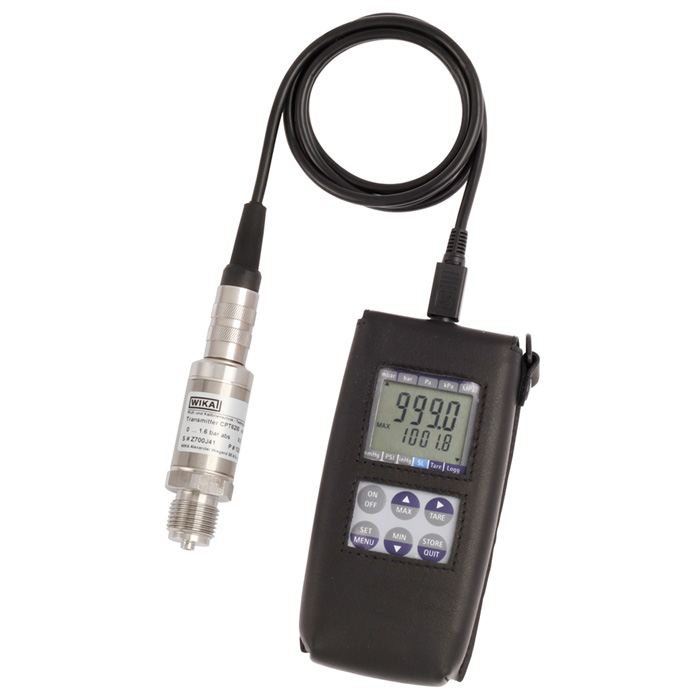 The digital indicator automatically detects the measuring range of the connected pressure sensor and guarantees a highly accurate pressure measurement. The CPH62I0 can be used for measuring both gauge and absolute pressure. Differential pressure measurement is possible with the 2-channel version CPH62I0-S2, and two connected model CPT62I0 reference pressure sensors. Selectable pressure units here are bar, mbar, psi, Pa, kPa, MPa, mmHg or inHg. An integrated data logger and various other functions such as Min, Max, Hold, Tare, zero point adjustment, alarm, poweroff, peak value detection (1,000 measurements/s), average value filter, etc. ensure that the CPH62I0 can be used for many different applications. In addition to the GSoft data-logger evaluation software for the tabular and graphical representation of the logged data, WIKA-Cal calibration software for calibration tasks is also available. WIKA-Cal also offers, over and above PC-supported calibration, the management of the calibration and instrument data in an SQL database. A USB interface is available for the data transfer.